If a blogger, news source, or anyone writes about you or your brand on their website but doesn’t link to you, it can be a bummer. However, most of the time, it’s simply an oversight. It can often be remedied just by reaching out to the author and asking for the link. Simple as that. Unfortunately, it doesn’t always work that way. In this tutorial, we’ll show you how to find any unlinked brand mentions and give you tips on how to reach out and ask for that precious link. 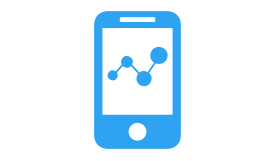 There are a few tools that can help you find your brand mentions, but we like to use Moz’s Fresh Web Explorer which is a part of their Moz Pro subscription. We’ll be using that tool for the purpose of this tutorial. On the main page of Fresh Web Explorer, you’ll see a search bar and a list of search operators. There are plenty of different ways that you can search for your brand, but there is one that we like to use specifically for finding unlinked brand mentions. We’ll use Google for this example. First, type in your brand name. And then finally the root domain of your website. This search operator is telling Fresh Web Explorer to find all pages that mention Google and also don’t have a link to google.com. Now you can see all of the pages that have unlinked brand mentions. The default is to search for mentions in the last week, but you can change it to the last two weeks or last four weeks as well. 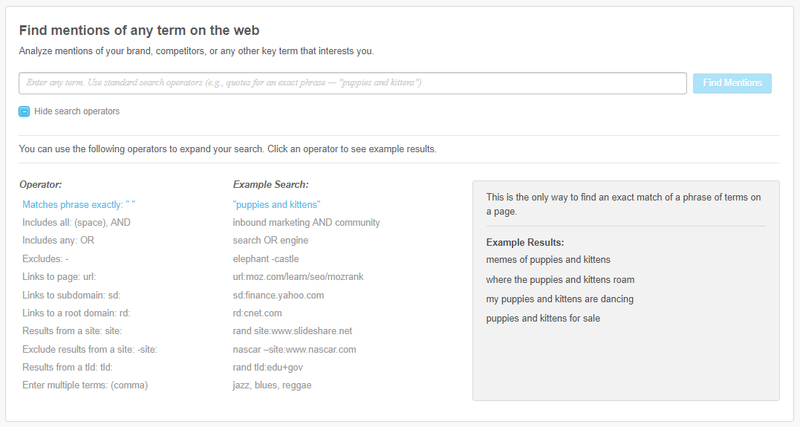 You can also sort by Mention Authority to better prioritize your outreach. I have good news and bad news. The good news is that this author wrote about you which means that they probably know who you are, making it much more likely that they are willing to link to you. The bad news is they don’t have to link to you. That’s right. Even if it’s a direct quote, they are not required to link to your website. With that in mind, here are a few tips to remember when reaching out to the author. This is obviously assuming that they are mentioning you or your brand in a good light. If they’re not, definitely don’t reach out for a link. The fact that they mentioned you means that they think that you’re worthy of sharing with their followers and can (most of the time) almost be seen as a personal endorsement from the author. Even without a link, there’s potential for the article or post to bring traffic to your site via searches, so always start off with a thank you. Everybody loves a good pat on the back and it’s always better to compliment someone right before you ask for something. If you’re a parent, you know exactly what I’m talking about. “Mom, did you do something different with your hair? It looks so long and pretty today. Look at the structure of their article and take the time to acknowledge how they are striving to communicate their ideas. Chances are the author spent a long time writing and structuring out this article. They’ll appreciate someone mentioning their communication strategy and skills. However, this only works if the compliment is genuine. If Mom didn’t actually do something different with her hair, she’ll see right through the compliment, meaning no Fast & Furious 22. This is especially true of seasoned SEOs. They receive outreach emails all the time and can definitely see through fake “insert compliment here” comments. If you can’t find something to compliment, just don’t include one. It’s better to do that than to include one that you don’t really mean. This email should be short and sweet. As I mentioned before, the author wrote about you, so they almost certainly know who you are. Most of the time, it’s simply an oversight and the author will fix it right away. If you feel like you have to convince them for some reason, they’ve probably already decided to not link to you on purpose. If that’s the case, just thank them for the mention and move on to the next one. So, what does this all look like in practice? 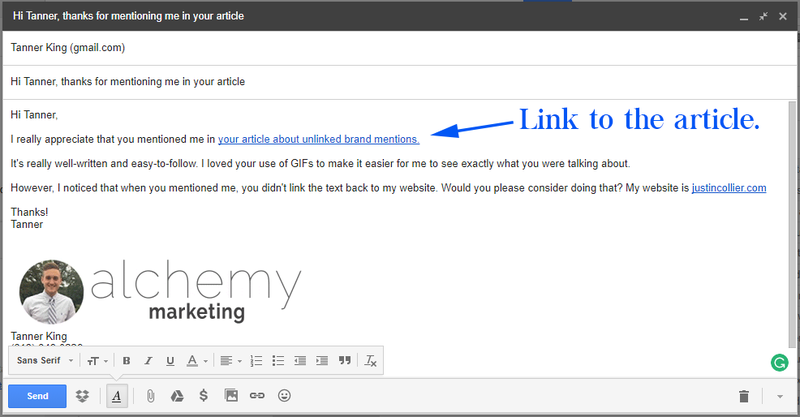 I’m glad you asked because I just put together an email to a guy that wrote an article about turning unlinked brand mentions into links, but never linked to me. What a jerk. Here it is!